This is the blog for Douglas Kennedy which complements his arts and entertainment tweets. The writer is a Brisbane journalist who has both been heard on radio and read in the print media. RODGERS AND HAMMERSTEIN RULE OKAY! South Pacific by Richard Rodgers and Oscar Hammerstein II. Queensland Performing Arts Centre’s Lyric Theatre. Stars Lisa McCune, Teddy Tahu Rhodes. Directed by Bartlett Sher. Season till January 27. Believe it or not there’s some who want to wash post-war musical theatre icons, Richard Rodgers and Oscar Hammerstein II, right out of their hair. There seemed to be a certain mood on opening night (among a few) that the most successful Broadway team of the 1940s and ‘50s, composer Rodgers and lyricist Hammerstein, were old-fashioned. On many occasions old-fashioned just happens to be one of the best and most engaging fashions in the world. Almost everything that happened the day before yesterday is old-fashioned and a lot of it – not all of it – stacks up pretty well. Writer L.P. Hartley said, ‘the past is a foreign country they do things differently there’, and I’m one of its most dedicated tourists. If God or the Central Committee for Human Supply – or whoever runs the ebb and flow of humankind – had given me an option, I would have spent 10 years of each of my three score years and ten in a different century. That would have given me seven lives in seven magical centuries unless, of course, I was lucky enough to be born in the year of the cat. I guess that would have given me nine lives. Ah life as a degustation meal! One of the most exciting decades to have lived would have been the 1950s when there were more changes happening than at a Victoria Beckham house party. There was a wealth of forward looking literature, art, movies, plays, shows, design and on top of all that the origins of television and rock ‘n’ roll shaking down a generation. But on Broadway the dominant musical presence of Rogers and Hammerstein, who had reigned supreme since teaming up to create Oklahoma! in 1943, was grounded in a largely reassuring world of show business stability. In 17 short years, from 1943 to Hammerstein’s untimely death in 1960 at the age of 65, the duo produced at least five masterpieces (Carousel, The King and I and The Sound of Music among them) which earned them 34 Tony Awards, 15 Oscars, two Grammys and a Pulitzer Prize. Rodgers & Hammerstein came together in the tumultuous war years – the South Pacific story was played out in early ‘40s and premièred in 1949 – but for me they will be forever associated with the ‘50s. And I like to travel to the ‘50s in my version of historic tourism as much as anywhere. The other interesting aside I picked-up – and let’s be clear I am only tackling the dissenters as many first nighters loved the production – was the contrast between petite bird-like Lisa McCune as Nellie Forbush, picking her way through the notes, and Teddy Tahu Rhodes’ stoic operatic French plantation owner Emile de Becque. There was a universal nod in Rhodes’ direction and a general acknowledgement that his sublime de Becque ticked all the boxes in what was no less than a towering performance. The pinnacle of which – as it should be – was Some Enchanted Evening which gave Rhodes the opportunity to shine like the Bethlehem star and was a sure-fire show stopper. Some thought that McCune was comparatively lightweight – although I am Going to Wash that Man Right Out of My Hair was well received – but then Nellie is from the heartland of small town America Little Rock, Arkansas, with all its lightweight and unenlightened ways. When Mary Martin was invited to play the original Nellie back in ’49 she agreed on the understanding that she would not have to sing a duet with the operatic giant Ezio Pinza, as she feared he would, musically speaking, blow her away. I think that the musically contrast, between Nellie and de Becque, is an appropriate metaphor to the cultural differences which go to the core of South Pacific’s inter-racial themes. The story of two pairs of unlikely mix-race lovers – Nellie and de Becque and Lieutenant Cable (Daniel Koek) and the islander Liat (Celina Yuen) – in the South Pacific at the height of the war was touchy if not controversial in its day. Hammerstein was under a lot of pressure to cut Cable’s lyric for the song, You’ve Got to be Carefully Taught, in the show’s try-outs because it touched a raw nerve with America’s racially sensitive Broadway audiences. But Hammerstein was the author who had given the world the ground-breaking musical theatre game-changing Show Boat (along with Jerome Kern) back in 1927. As lawyer Geoffrey Robertson writes in an essay on the show, and the South Pacific during era, for the program, the number represented why Rodgers and Hammerstein wanted to write the show in the first place. Robertson actually attributed the quote to author James A. Mitchener who penned the book, Tales of the South Seas, which Rodgers & Hammerstein used as their primary source. This Australian adaptation of the latest New York production – known as the Lincoln Center Theatre production and the first ever Broadway revival since the 1949 premiere – is generally faithfully to a great musical love affair on all counts. In addition to the talents mentioned, Brisbane-born Gyton Grantley (known for playing Carl Williams in Underbelly and TV’s new hit show House Husbands) handles the comic character Luther Bliss with aplomb and Christine Anu is suitably testy as Bloody Mary. 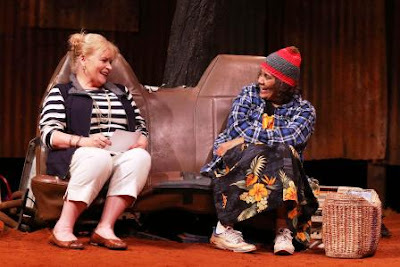 The ensemble – both nurses and Seebees – added theatrical and musical colour to the show and with the likes of John Frost and Opera Australia’s Lyndon Terracini at the production helm the fire proofing is double-glazed. There’s several more enchanted evening ahead as South Pacific continues at Brisbane’s Lyric Theatre until January 27. When it comes to presenting musical theatre in Brisbane, there’s nothing like a name and there’s several impressive ones here. 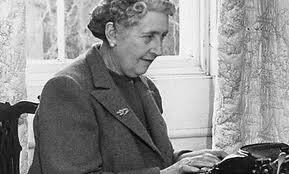 The Quen of Crime Fiction Agatha Christie. From left Christy Sullivan (Mollie Ralston), Gus Murray (Giles Sullivan) and Justin Smith (Detective-sergeant Potter) in the Diamond Anniversay Australian production of the Mousetrap. 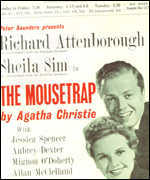 Below Richard Attenborough nd Sheila Sim in the original 1952 production. THE LITTLE MOUSE TRAPPED IN A GRIM REALITY. The Mousetrap by Agatha Christie. Queensland Performing Arts Centre’s Playhouse Theatre. Cast: Ensemble. Diamond Anniversary Production Directed by Gary Young. Season till January 20. Agatha Christie’s The Mousetrap is a theatrical phenomenon, wrapped in a mystery, which comes from some parallel universe which has little to do with any time and place we know. It’s a bit like a Doctor Who time travel episode, where he goes back to some strange unrealistic past, but this time around there’s no Time Lord or Tardis to give the story a sci-fi context. The Tardis, however, did give us some sense of normality when it first came into view back in November, 1963, - incidentally the day after another surreal event, the assassination of President John F Kennedy – because it took on the familiar shape of a police telephone box. Likewise, Christie’s The Mousetrap, which started ‘life’ as a thirty minute radio play, Three Blind Mice, as part of the 80th birthday celebrations for Queen Mary, is shrouded in familiarity. That’s the Agatha Christie reality show, where a group of middle-class character types, fueling suspicion and undoubtedly awash with dark secrets, meet in a secluded snowbound manor where someone has murder on their mind. Queen Elizabeth’s grandmother, it appears, loved Christie’s work as did millions of devoted fans who made her books the most read in the English-speaking world behind The Bible and Shakespeare. So it’s perhaps understandable that the 1947 radio play should morph into the 1952 West End stage production, starring husband and wife actors Sir Richard Attenborough and Sheila Sim, with little more than a name change. There was already a play called Three Blind Mice. The play was a charming little drawing room whodunit – with eight characters and a dash of humor – which has a murder in the first act and lot’s of talk in the second. Critics and commentators are discouraged from examining the plot too closely in reviews for fear of accidentally publishing too many clues or, what producers call, a spoiler. The Mousetrap is widely recognised as a charming little piece of classic middle-class theatre – good fun but hardly great drama – but one aspect of the play is talked about endlessly. Now come has it been on the West End stage for the past 60 years and broken more records then those angry Yanks when John Lennon said The Beatles were bigger than Jesus or was it Elvis? In November 2012 it topped the 25,000 performance mark in the West End and it is still going strong at home and abroad, including Australia and New Zealand. There’s more written about the trivia surrounding The Mousetrap, and the legendary statistics, than the play itself. My personal favourite is the one where Christie addressed cast concerns about the second act with: “I should stop worrying and get-off to bed. The spoiler phobia is such that the narrative is difficult to share, but there is one dark secret contained within The Mousetrap, that is seldom mentioned and that’s the real-life death which triggered Christie’s thinking in the story. Generally, there’s only one youngster who is referred to in The Mousetrap mythology and that’s Christie’s grandson, Mathew Pritchard, who was nine-years-old when the play was first produced. The writer gave the son of her only daughter, Rosalind, the rights to the play before it was realised that there was more than, ‘a nice little run’, to be had from it. However, the ghost of another little boy, 12-year-old Dennis O’Neill, looms large over The Mousetrap. There were no twists and turns in his little life except, perhaps, for the injuries he sustained while in the care of a Shropshire farmer, Reginald Gough, and his wife Esther. Dennis, and his brother Terence, were the subject of shocking headlines in the British press as the Allied troops were flooding into Europe to destroy the Nazi threat in 1945. Dennis died as a result of the ill treatment he received from the Goughs. The ensuing court case, which saw the Goughs sent to trial and imprisoned, shocked and horrified post-war Britain and led to a major inquiry under Sir William Monckton and ultimately changes to the foster laws. It’s easy to see why people were so shaken with the O’Neill story when you read or sing Vera Lynn’s anthem to a peaceful and sublime post-war future, White Cliffs of Dover. The British dilemma was that they were what the Yanks call the good guys but still 12-year-old Dennis was dead, while being cared for by responsible adults, who were supposed to protect him. Why wasn't Dennis - like Jimmy - snuggling down to sleep in his own little room again? It would appear – that along with the British public – the case gave Christie a rare opportunity to be inspired by the headlines of the day. I sincerely don’t believe that revealing this connection is a ‘spoiler’ as the link was widely reported when Terence O’Neill's book was launched in 2010 and the real-life story is nothing to do with the final bombshell. However, I do think it’s important that the memory of young Dennis O’Neill, and what happened to him, is not superseded by what is in truth mere light entertainment. Vera Lynn sings White Cliffs of Dover. I am absolutely delighted as I have had more than 4000 hits although I haven't posted since the 2012 Olympics. Now I am ready to jump into the postings game once again with a 2013 series. Sir Haulway Barrack- Jones has been dispatched to the Michael Burns Kennedy Tales Tales site, while this one is reserved for stage, performance, film and the occasional visual arts. I'll keep the old boy on the address below and make this one more legit.